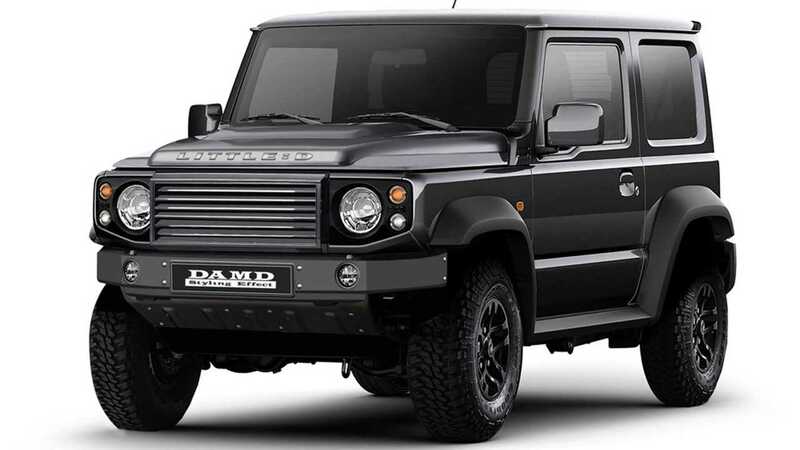 Damd is the latest Japanese tuning house to try to turn the new Suzuki Jimny into a mini Mercedes-Benz G-Class, and the effort looks a lot more attractive than Liberty Walk's effort to our eyes. The company is also taking things a step further by making a body kit that gives the little Suzuki a visual appearance akin to the classic Land Rover Defender. Damd calls this pair the Little G and Little D respectively, and both of them go on sale in 2019. With its boxy aesthetic, the Jimny already resembles the G-Class and Defender, but Damd installs the little touches that make the difference. The Little G gains a new grille with a bar running through it like Mercedes' design. The lower fascia also takes on the German SUV's three-inlet layout. Revised fender flares are more angular than Suzuki's stock pieces and blocky trim runs the length of the vehicle. Even the spare tire carrier gains a cover like the one on the G-Wagen. The Little D is just as impressive of an approximation of the Defender. Damd's new hood nails the classic Land Rover's shape. However, some owners might want to leave off the Little D branding that's prominently on the front edge because it could send the wrong message to other folks in the road. The kit also includes a revised grille, bumper, and skid plate that create a fantastic recreation of a Defender's nose. A new rear bumper and mud flaps complete the transformation at the back. According to Damd, pricing for these body kits is still being determined. It's still likely less expensive to buy a Jimny and these pieces than a new G-Class or used Defender in perfect condition, though.